MAN showcases integrated solutions for the construction sector at bauma 2016. An MAN for tough terrain and high loads: MAN TGS 41.480 8x8 BB with large off-road tyres sized 14.00 R 20 up front and 12.00 R 24 in the rear. MAN will use five exhibits in hall B4, stand 225, to showcase its expertise in the construction sector. The display on the stand will include a crane tipper from the TGL series, a two-axle MAN TGS with HydroDrive as a semitrailer tractor, a payload optimized truck mixer on a four-axle MAN TGS, a MAN TGS designed for 33 tonnes for the mining industry and a three-axle MAN TGX tipper with the new 560 hp D38 engine. Four other vehicles will also be located in an open space in front of hall B4 at the exit next to the stand. Here, MAN plans to exhibit a MAN TGX 41.640 heavy-duty semitrailer tractor with the D38 engine, a five-axle MAN TGS designed for a gross permitted weight of 50 tonnes, a MAN TGS with triple-axle arrangement provided as standard, and a MAN TGM in all-wheel drive version. 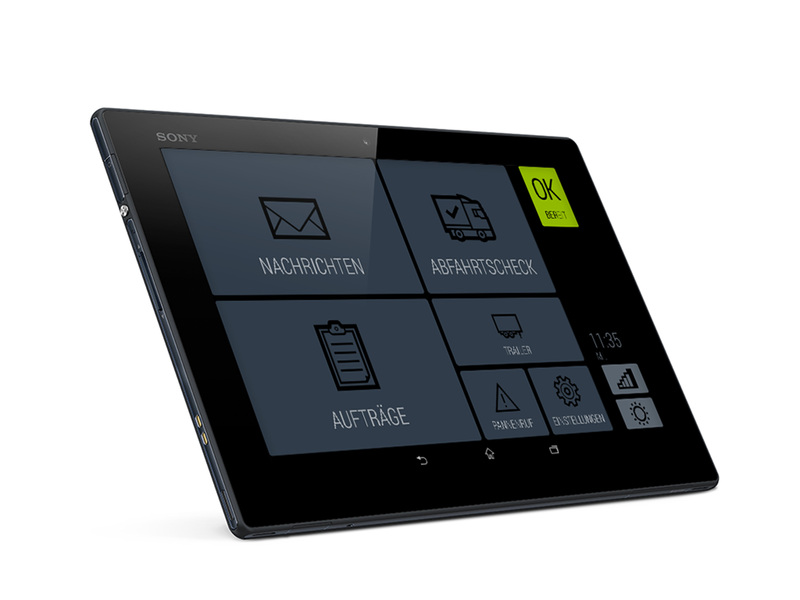 The needs of the user provide the focus for the MAN product range - true to the trade fair motto, “You can count on MAN”. MAN's sector-specific focus is evident in many areas, for example in the choice of three possible all-wheel drive technology variants. The MAN HydroDrive, an optional hydrostatic drive in the front axle, is an ideal addition if the vehicle travels predominately on sealed road surfaces and only occasionally needs additional traction. The launch of the MAN Hydrodrive in 2005 represented the introduction by MAN of a new drive technology variant on to the market. The technical solution of a hydrostatically driven front axle to increase traction when required and to deliver a strong braking effect on steep offroad slopes was welcomed in many sectors with great interest. HydroDrive is thus available on the market in a wide range of drive configurations for two-, three- and four-axle vehicles. MAN has continued to develop this system and improve its operation in practice for users. The routing of the hydraulic lines has been optimised and the clearance around the wheels increased making larger rim and tyre widths possible - even with tyre chains attached. MAN is to announce an extension to its range of drive configurations at bauma 2016. MAN HydroDrive in combination with an automated gearbox is likely to be available to order from IAA 2016 onwards. At bauma 2016, MAN is to launch a new light hypoid tandem axle unit for payload-sensitive transport tasks. In comparison to fitting a planetary axle, this weighs in at approximately 280 kilogrammes lighter. Compared to normal hypoid axles currently available with a 13-tonne load capacity, a weight advantage of 180 kilogrammes is achieved. In terms of truck mixers, this means for example that it is possible to transport 180 kilogrammes more concrete or water. The requirement for the use of thermo-insulated bodies when transporting asphalt adds additional weight. The operator is now able to compensate for this payload loss with a lighter axle unit. This tandem axle unit also has other advantages besides the payload argument: Slightly less diesel is used compared to vehicles fitted with planetary axles. In a direct comparison of hypoid axles, the new axle construction - designed for a payload of 11.5 tonnes - also offers additional ground clearance of approximately four centimetres. 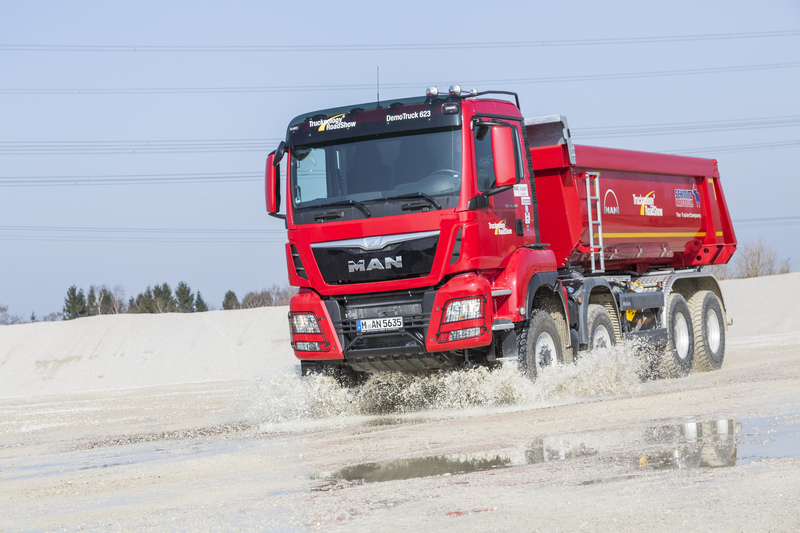 This means that, also with hypoid axles, MAN now meets the authorisation criteria for an offroad vehicle (N3G) of medium-high design height and with 315/80 R22.5 tyres. The new axle unit is available for vehicles up to 480 hp in normal height design for leaf-leaf and air-leaf suspension versions of the TGX 6x4, TGS 6x4 and 8x4. This also includes the TGM in 6x4 drive configuration. The TGX 6x4 and TGS 6x4 and 8x4 also benefit from this equipment alternative in the medium height version with leaf-leaf suspension. 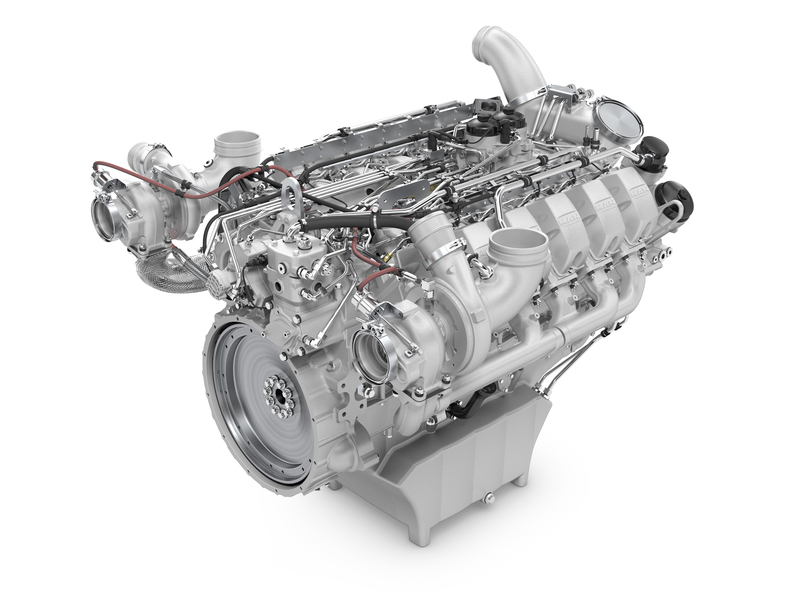 MAN is showcasing the powerful D38 engine in the TGX series for the first time at bauma. This combination represents the perfect vehicle for heavy-duty traction operation. With high engine power over 500 hp, you can transport heavy loads and also achieve high average speeds. Typical applications include tilting articulated trains or 6x4 tippers frequently used with trailers, as well as heavy-duty roll-off skip loaders. In construction traffic, for example, if low loader trailers with heavy-duty construction machines need to be pulled, then the TGX D38 with 520 and 560 hp can move up to a gross train weight of 120 tonnes with ease - depending on the driveline design. In line with sector requirement, MAN is adding the TGX D38 in normal as well as in medium design heights and with tough steel bumpers to the product range. The two-stage turbochargers characteristic of MAN engines means the 6-cylinder in-line engine with 15.256 ccm displacement reaches its nominal torque of 2700 Nm at 930 rpm. The full torque can also be used in a wide torque range of 930 to 1350 rpm. This means that in traction applications, this top-of-the-range model draws upon its great tractive power at low speeds, changes gear at an early stage and keeps the engine torque high in high gears. In summer 2015, MAN switched the TGX D38 series over to the new TipMatic TX gearbox generation. Its direct-drive version is designed for the high torque of 2500 to 2700 Nm produced by the D38 engines. This TX gearbox provides the customer with a number of convenience functions. The following functions from the catalogue are particularly suited for use in the construction industry. Thanks to the integrated gradient sensor, the TGX D38 takes the current topography into account when selecting a gear. The driveline always finds the right gear for moving off – whether driving uphill, with an empty vehicle or with full loads. On a snow-covered carriageway for example, or on lightly compressed ground on construction sites, this function on the TGX D38 makes it easier for trucks which are stuck to pull away. If the rocking free function is activated, the clutch opens very quickly, so long as the driver has lifted off the accelerator. If the accelerator is pressed again the clutch closes, allowing the driver to carefully rock the vehicle free. A suitable gear is selected automatically here in order to reduce the torque to the drive wheels and thus avoid wheel spin. The interaction between the accelerator position and clutch controls has been designed to function even more smoothly so that the driver can manoeuvre more accurately at the loading ramp or in confined construction sites. The aim of other functions available on the TipMatic TX gearbox is rather fuel saving. They therefore contribute positively in terms of the TCO of the MAN TGX D38. The new EfficientCruise GPS cruise control with EfficientRoll “sailing” function were brought into this series along with the TipMatic TX. The combination of both factors provides potential savings. The system utilizes the 3D map material of the terrain to anticipate the course taken by the road and adapts the speed accordingly. At the same time, EfficientCruise anticipates gear selection and shifts down into the appropriate gear before uphill sections. The aim is to manage the uphill section without tractive force interruption. For short inclines, the vehicle completely prevents downshifts if possible. With the knowledge of the topography of the course of the road ahead, the vehicle shifts up a gear at an early stage if this is likely to have a positive effect in fuel saving. This is where the speed shifting functions play their part. Thanks to the specific coordination of engine, clutch and gearbox control, it shifts even more quickly between the three highest gears – 10th, 11th and 12th. This means, for example, that the gearbox can shift down more quickly when going uphill and the torque for tractive force interruption is shortened. This in turn means that greater momentum is maintained, saving on the vehicle's fuel. The Idle Speed Driving function uses the high torque of the 15.2 litre engine at low speeds which provides greater comfort when driving slowly and saves fuel. This is particularly practical in stop-go traffic or when coasting up to a roundabout. In such situations, the vehicle will continue to move forward with the engine at idling speed and the clutch closed, as long as the driver does not brake. The MAN TGX with D38 engine provides top performance for heavy-duty transport. The four-axle MAN TGX 41.640 8x4/4 combines the most powerful version of the D38 engine and the MAN TipMatic TX with the standard converter-clutch unit. Thanks to the strong torque of 3000 Nm, even heavy-duty transport of 250 tonnes can be moved smoothly and powerfully. The converter-clutch unit allows for particularly precise shunting in tight spaces, on inclines and with heavy loads. The launch of the MAN TGX D38 was the reason to extend the range of models in the heavy-duty transport segment. As regards cabs, there is a choice between all widths XL, XLX and XXL, and now also right-hand drive ex-works. Important for heavy-duty transport operators: the wheelbases on the new Euro 6 version with the D38 engine are the same as the current Euro 5 design with the V8 engine. This means that the cornering characteristics of the towing vehicle and the connected trailer or semitrailer remain the same. The existing reports continue to be valid without alteration. 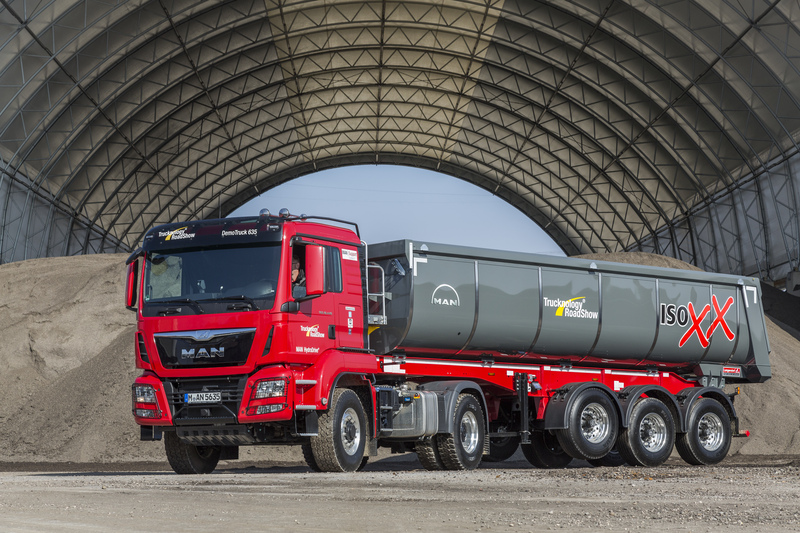 MAN offers four-axle chassis from the TGS series with a two-part exhaust system. The diesel particulate filter is fitted between both front axles, and the SCR-cat is positioned on a frame behind the cab. The extension to the variant range is new for bauma 2016: This version is now also available with the 8x4 drive in combination with the longer L and LX cabs. It has so far only been offered with the M cab in drive configurations 8x4, 8x6, 8x8 and 8x6H. The advantages of this arrangement are the avoidance of dust turbulence by means of an exhaust tailpipe which discharges downwards, and the increased space provided in the frame between the second and third axles. This free space can be used for a larger fuel tank or for additions needed by the body. Alternatively, a vehicle with a shorter wheelbase may be chosen to increase manoeuvrability. This emission control system configuration is also available for the standard five-axle, created by attaching an 8x4 to a steered trailing axle. For mining and gravel extraction operations, MAN offers the tough and resilient MAN TGS chassis from its WorldWide product family in markets outside Europe. The vehicles are optimised to meet sector requirements: The tandem axle unit on the MAN TGS 33.480 6x6 BB - an exhibit at bauma - now has a longer wheelbase of 1500 millimetres. This means that large format 16 R 20 tyres can be fitted. If the ground conditions require them, 24 R 20.5 format tyres also fit on the tippers. The MAN TGS dumper truck, designed for a gross permitted weight of 33 tonnes, is therefore ideal as an alternative to the articulated dumper which is significantly more expensive to purchase. The MAN TGS WorldWide, designed by the Munich based commercial vehicle manufacturer, represents a truck to cope with challenging road situations as well as extreme climatic conditions such as icy temperatures, snow and extreme heat. The heat retention function, which remains active in neutral, has proven itself in Arctic climatic regions and in frosty winters. It ensures operational capability of the vehicle in temperatures of up to minus 40°C. The MAN TGS 40.540 6x6 BBS from the TGS WorldWide series is available for the toughest of transportation tasks. The combination of the three-axle towing vehicle with 540 hp engine, MAN TipMatic automated gearbox with converter-clutch unit (WSK), leaf-sprung planetary axle and additional radiators for engine, gearbox, WSK and transfer case is ideal for gross train weights of up to 250 tonnes at maximum traction. This vehicle is designed for worldwide operations. It is available as both a left and right-hand drive vehicle and also in emission categories Euro 4 and Euro 5. Air intake as well as exhaust tailpipe are raised for rough operating conditions; it has a steel bumper and tyre formats 325/95 R24 and 14.00 R20 may be selected. Heavy duty equipment ex-works is a tradition at MAN. Components such as two-stage trailer hydraulics, register coupling, heavy-duty trailer coupling at normal and low mounting positions, sliding device for fifth-wheel coupling and support plate for swan neck can of course also be supplied by MAN with this towing machine. The Euro 5 exhaust classification is increasingly gaining in importance in markets outside Europe. MAN is therefore introducing common rail engines to the TGS Worldwide series from the D20 and D26 series for the first time in this exhaust classification. These come from the D20 engine series with 320, 360, 400, and 440 hp. The D26 covers the 480 hp and 540 hp versions. All the engines are 6 cylinder in line engines. Designed for installation in construction equipment, the MAN D28 twelve-cylinder engine achieves a maximal torque of 5000 Nm.